We moved to Fayetteville from Memphis in 2005. Before that I lived in Memphis for 20 years, got a BA in Psychology, an MA in Speech Pathology and after 10 years of working as a Speech Pathologist decided to take on the more serious job of being a mom. I now improve the speech and language skills of various students in an elementary school and bring Ella with me to work and next year, both kids. Fayetteville is a nice place to live and raise kids and we are very happy here. 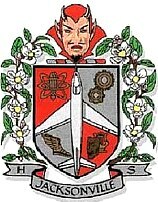 It is a product of Classreport, Inc. and may not be affiliated with Jacksonville High School or its alumni association.